Treat Me To A Feast: Notes From My Abundant Life: Rest. It is time to rest. Before my body begins to resist, it is time to rest. Before my mind starts playing its tricks, it is time to rest. I am tired. I am seldom tired. I know when to slow down, but lately I greet each morning weary when I rise from my bed. Thank You, Lord, for giving me the good sense to slow down before I fall down. Today in my weariness, I fought the temptation to respond in anger instead of retreating in silence. I could feel the pull. While I should have been listening to the Universe, in my weariness I succumbed to my flaws and my frailty. I should have done nothing more than stand by. Fortunately I did no irreparable damage. Lord, you have called me to rest, and I am on my way. Tomorrow, I will not fight. I will not get angry. I will hide myself safely in The Rock. 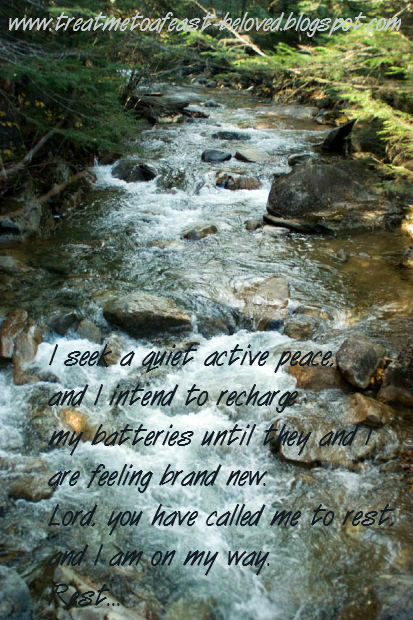 I’m remembering the vow I made, “Lord, I’ve decided to hide myself in You, and I ain’t comin’ out.” I seek a quiet active peace, and I intend to recharge my batteries until they and I are feeling brand new. Lord, you have called me to rest, and I am on my way. Rest. I shall rest. I shall find my quiet place, and remain there until He determines that I should move. And when I move, it will be slowly, deliberately, fully enrobed in His Will. I’m going into hiding, and just the thought of it makes me feel better. Who might imagine that a retreat would be worthy of celebration? 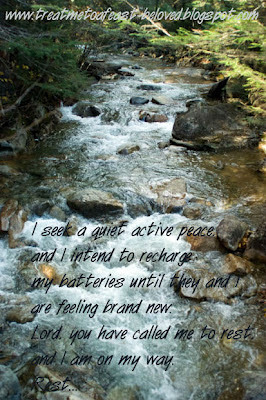 Lord, you have called me to rest, and merely the thought of it refreshes my soul. That refreshment is today’s reminder that God is good.